On March 5, 2019, OCRA united advocates from across the country for Spring Advocacy Day on Capitol Hill. 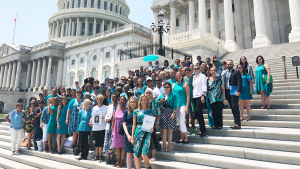 Together, this passionate group of survivors, caregivers and supporters used their collective voice to advocate for increased funding for ovarian cancer research and education. Read a recap of this incredible day of #TealAction. Registration for Spring Advocacy Day has now closed.